The first Metro train from Noida to Greater Noida could run as early as this December, three months before the March 2018 commissioning date. The 29.7 km corridor is racing to the finish line and, according to the DMRC, will be the fastest Metro project built in India. The Aqua line, as this will be called, is also setting another benchmark -of being the most economical Metro project to be built in the country. Originally assessed at Rs.200 crore per kilometre, the actual cost of the project could eventually be around Rs.150 crore a kilometre or even lesser. To put the figure in perspective, Delhi Metro's Phase 3 is being built at a cost of Rs.552 crore per kilometre. But it has both elevated and underground sections as opposed to the Aqua line, which is uniformly above the surface level. Officials said work on the Aqua line was also progressing fast because land acquisition for the project was easier. 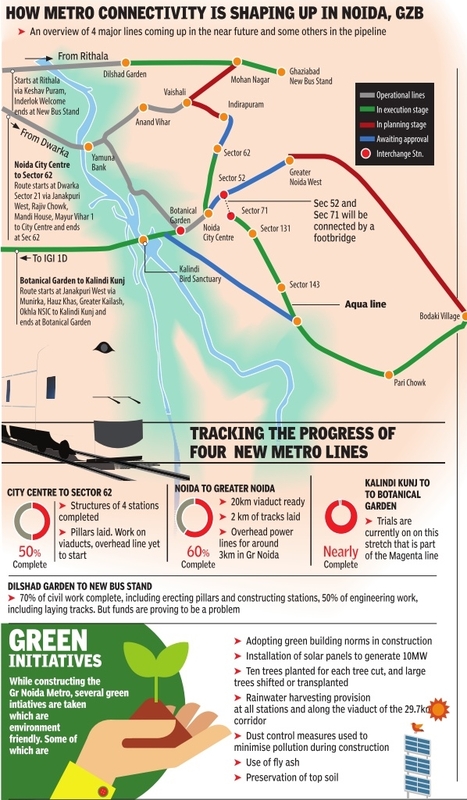 Land acquisition has been one of the major problems DMRC has had to contend with in Phase 3. Santosh Yadav, managing director of NMRC, said the line will generate 10 MW of solar power and each of its 21 stations will depict a special theme. 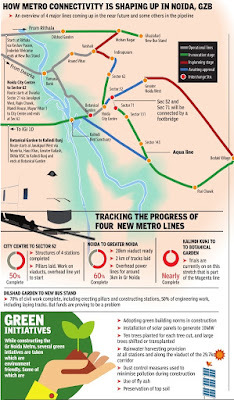 The Aqua line will be connected to DMRC's main grid via the Blue line, through an interchange at Sector 52 Metro station on the Noida City Centre to Sector 62 corridor, which is being built simultaneously . A footbridge will take Aqua line passengers from its originating station at Sector 71 to the Sector 52 Blue line station.